China will double its loans to Africa to 20 billion US dollars in the next three years, an apparent gesture to strengthen ties with Africa, an ally that serves as a supplier of natural resources to China and market for cheap Chinese products. China has been pouring money into Africa to win the fierce competition for the continent’s vast natural resources. Already China is Africa’s biggest trading partner, after surpassing the United States in 2009. While it’s up to individual African countries to choose economic partners from the current large pool, it is wrong to assume that a particular partner will somehow solve Africa’s economic and political problems. South Africa’s president Jacob Zuma, expressing optimism in the China-Africa ties says, ‘’We are particularly pleased that in our relationship with China, we are equals and that agreements entered into are for mutual gain.’’ China thus serves as relief from Western paternalistic and uneven relationship with Africa since independence. Africa ought to know that it really doesn’t matter who your partners are or what plans they have for you in economic development; rather it matters what plans and strategies you have for them. What China wants from Africa is quite clear: raw materials to feed its economic boom. And its strategy? More loans and aid for Africa to lure more countries to look eastwards. What is not clear is Africa’s strategy. Africa’s 54 countries, with a combined economy over four times smaller than China’s, are probably too small to succeed in the modern economic competition and globalization. They need to further integrate and present themselves as one economic entity. With continuing strong economic growth, an integrated Africa will make a more attractive investment destination for foreign capital and technology than a collection of tiny individual economies. Also, integration comes with increased clout and bargaining power. Economic development is a result of wealth creation and value addition to natural resources – not who your partners are! As long as plans and strategies of individual African economies do not reflect this realization, stronger nations will continue to acquire Africa’s natural resources at bargain rates. As Africa’s economic prospects brighten, she should not allow herself to become a proxy battleground for a shifting balance of power in the world’s larger economies. It is not China’s business to pledge assisting Africa to develop independently. A commitment to develop independently should be the goal of individual African country governments. The irony is that China still faces the same governance issues that loom over Africa’s long term success.� Also, let’s face it; no country’s motives are so pure that it only wishes others to ‘sincerely’ develop independently without consideration of self-interest. China is not in Africa to make free lunches for anyone – it’s none of its business anyway. On the contrary, Africa has been giving free lunches to many, through the provision of unprocessed crude raw materials for quite some time. It is folly to assume that Africa can negotiate mutually beneficial deals with the China when she has not resolved the issues that led to the exploitation of her resources by other partners. The author is the Regional Director of the World Youth Alliance Africa. These views are his own. 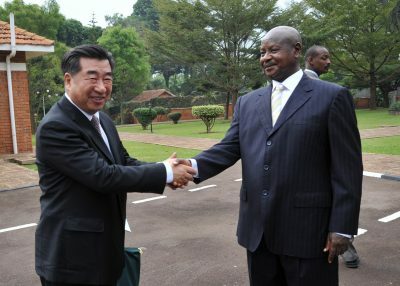 via The African Executive | Why China Will Not Solve Africa’s Problems. Disaggregating Chinese actors in Africa | East Asia Forum. Most discussions on Africa 15 years ago would have focused on topics regarded today as no longer relevant. For example, while the continent is still dealing with the consequences of HIV/AIDS and the rates of infection are the highest worldwide, the disease is no longer a defining issue. And no longer is there a Manichean debate about the role of the state and the market. It is broadly accepted that both an efficient state and open markets are necessary for development to occur, even though some governments are uncertain or incapable of creating one and lukewarm on allowing the other. Even during the 1990s the debate over how Africa could most quickly develop centred on the role of external actors, and the relationship between aid and poverty alleviation. This reached its zenith during the 2005 Gleneagles G8 summit when, at the urging of activist leaders such as British Prime Minister Tony Blair, it was agreed to double aid to the continent. Similarly, the African debt issue was virtually taken off the table through a combination of the Highly-Indebted Poor Country initiative and the Gleneagles proposals — which agreed to write off US$40 billion in debt owed by 18 poor countries to the International Monetary Fund, World Bank and African Development Bank. Africa was also at the start of a period of ‘redemocratisation’ in the mid 1990s. At the end of the Cold War, 70 per cent of African countries were considered to have ‘unfree’ political systems, as classified by Freedom House. By 2010, more than two-thirds were ‘free’ or ‘partly free’. Much debate then looked at how best to keep militaries in the barracks while restoring respect for civil–military boundaries. Today, Africa is in the midst of a global commodity boom which, combined with profound technological changes in the form of digital communications, has driven up growth rates. Whereas by the mid 1990s African telephone connectivity was just one-tenth of the global average, today it is half this average, even though the global figure has increased fourfold to 70 connections per 100 people. In the 2000s, meanwhile, sub-Saharan Africa enjoyed its best growth decade on record since independence. Rather than engaging in the old state-versus-market debate, there is now a common appreciation of the centrality of economic growth as a necessary (if insufficient) condition for development. There is much more scepticism about the value of aid, at best viewed as a facilitator — not a generator — of development, and as comprising a range of deleterious side effects, not least the often broken link of accountability between leaders and the electorate. China has also emerged as a major force, not only as a provider of cheap goods and African infrastructure, but as a purchaser of African commodities and assets. Perhaps more than any other single factor, China’s interest in Africa has illustrated that the continent is not only a place where problems need solving, but somewhere business can be conducted and profits made. A welter of statistics is routinely trundled out to describe this engagement: that China’s trade with Africa has risen, for example, from under US$5 billion in 1995 to over US$130 billion in 2010; or that sub-Saharan Africa accounted for nearly 15 per cent of Chinese outward investment between 2005–10, having started with very little immediately before this. But China’s investment in Africa has to be carefully segmented, with each of these aspects in turn containing different challenges for African countries and other external partners. China’s growing role is not one-dimensional, since there is a whole range of Chinese investors and players in Africa, from those in the natural resource sector — including big state actors, smaller individual actors and those employing aid or assets-for-commodities swap deal methods — to the myriad small Chinese businesses across the continent. Each of these levels of engagement produces different outcomes and issues for governance, and domestic and international politics; for governments and private individuals; and for competing businesses. Hence they also give rise to a set of different development and strategic choices, meaning a deep understanding of these aspects is absolutely critical. There are many diverse impacts resulting from this expansion of interest into Africa, not least for matters of governance, and not all of them positive. In September 2007, for example, the Congolese government and a group of Chinese state-owned enterprises signed a bilateral investment and trade agreement under which the Chinese committed to construct a number of roads, railways and hospitals. The initial deal stated that the project would be carried out by Chinese companies and financed by loans from the Chinese Export-Import Bank, and was estimated to be worth US$9 billion. In return, a Congolese–Chinese joint venture with Chinese majority participation was to be created to extract and sell Congolese copper, cobalt and gold. This would ensure the loans were reimbursed. Though there is an infrastructure dimension, even in its newly revised form such a deal can do little to change Africa’s status as a raw material exporter and will do little to achieve Africa’s aim of increasing diversification and local job creation. And further loans to a country like Congo can only see it become stuck deeper in the mire — one reason the multilateral agencies initially objected to the deal. Yet such swaps are mostly about the elite’s ability to capture resource rents, with little hope of further redistribution or the promotion of democratic values. There is also a displacement effect on the local economy from increased investment. For example, Guy Scott, the vice president of Zambia, has noted about Chinese migrants in his country: ‘the guys we’ve got … are people who have difficulty getting work back in China … They have started to compete with Zambians at quite a low economic level — raising chickens, for example … They don’t take weekends off, and they live four to a room. And they get money at six per cent interest from the Bank of China, compared with 25 per cent that Zambian contractors have to pay’. Recent research by the Brenthurst Foundation focusing on small Chinese traders across five southern African countries shows how these businesses receive no Chinese or African state support and are deeply mistrustful of the local people and authorities. The key question for Africa to come out of this research is why Chinese entrepreneurs with limited local knowledge and support bases often succeed in the very areas where local Africans should be more competitive. China, of course, is not the only new actor. Other countries, including Turkey, Brazil and India, have also shaped a more positive view of Africa as a place to do business. In 2011, for example, India announced US$5 billion worth of development deals in Africa for a three-year period. Still, the continent has a lot for which to thank China in particular. Chinese growth has driven up commodity prices to the benefit of many African countries, even if this is only temporary, and Chinese investment has also opened the world’s eyes to African opportunities. But these countries would do well to ignore grand political statements on south–south cooperation from Beijing: China is relentlessly pursuing its own interests in Africa, make no mistake about it. That doesn’t make it any less of an opportunity for African states, but it does require them to devise a clear development strategy to engage with China, and other potential investors, in accordance with theirinterests. Dr Greg Mills is Director at the Brenthurst Foundation, South Africa. Dr Terence McNamee is Deputy Director at the Brenthurst Foundation. This article appeared in the most recent edition of the East Asia Forum Quarterly, ‘China’s Investment Abroad’. via Disaggregating Chinese actors in Africa | East Asia Forum.